Amazing thriller, with a dark side, some sickening violence, and with a slightly weak ending. Carl Mikael Blomkvist is a financial journalist who has been accused of and found guilty of libel against a business tycoon. He has been handed a hefty fine and three months in jail. 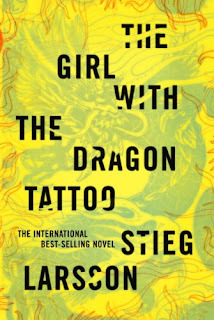 Lisbeth Salander is a 25 year old hacker who does PI (private investigative) work for a security firm, but someone who has also been deemed as legally "incompetent", is regarded as a "retard", has a mostly undisclosed history of abuse, and who may also be suffering from Asperger's Syndrome (hinted at but not stated definitively). And then there is Henrik Vanger, the octagenarian patriarch in retirement of Vanger industries. He has been obsessed with the disappearance of his grand-niece almost forty years ago. Vanger proposes to Blomkvist that he write a history of the Vanger family and also try and find out what happened to his grand-nience, Harriet Vanger, who he suspects was murdered. No body was found, no one was suspected, and no one charged. Yet, a grim and smug reminder of her disappearance makes an annual appearance at Henrick Vanger's house. As Blomkvist starts his work, first alone, and then with the help of Salander, things start to go horribly wrong. A sadistic murderer may in fact be on the loose. Blomkvist's life may be in danger, in mortal danger, Salander herself has to deal with abuse, Blomkvist's newspaper may be in danger of going down in the wake of the libel suit, and the Vanger family is no gathering of saints. This is by far the best fiction book I have read in almost ten years. The pace is measured, even slow at times, but never slackens. Enough detail is included to keep you involved. The central characters are thoughtfully etched out. There is substantial dialog between the characters; important if you are to build empathy, or antipathy, towards the characters, and yet given short shrift in so many works of fiction.